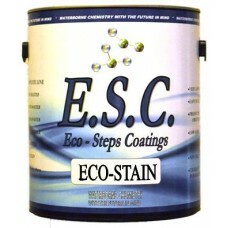 ECO-STAIN is a waterbased stain designed to give rich deep colors on wood with little or no grain-raise. Application: ECO-STAIN can be brush, rolled or sprayed. To prevent the stain from lapping apply very liberally which will allow sufficient time to wipe the excess off in the direction of the grain. On wood species that tend to blotch use ECO-STAIN conditioner first. Dry Time: ECO-STAIN is designed to dry quickly yet give sufficient time to work. Product must be completely dry before another coat is applied. Normal topcoating can be done in 15 to 30 minutes. Clean-Up: Clean and flush all equipment with water immediately after use.